UPDATED: Thu., April 13, 2017, 4:32 p.m.
How do you celebrate 40 years of “Star Wars” in 90 minutes? With a surprise Harrison Ford appearance, a touching Carrie Fisher tribute, a John Williams performance and a fair amount of jokes about George Lucas’ dialogue, of course. Attendees at Star Wars Celebration were treated to that and more Thursday in Orlando, Florida, at the kick-off of the four-day fan event marking the anniversary of Lucas’ space saga. Actor Warwick Davis moderated the sprawling look-back at the four decade legacy, featuring appearances by Lucasfilm chief Kathleen Kennedy, Mark Hamill, Billy Dee Williams, Anthony Daniels, Peter Mayhew and Hayden Christensen. There were also video messages from Liam Neeson, who joked that a film was being made about Jar Jar Binks going to the dark side, and from Samuel L. Jackson, who cheekily suggested that his prequel character Mace Windu is not dead. Ford’s unexpected appearance garnered the most enthusiastic response from the thousands of fans in the convention center. “I can’t believe we managed to keep it a secret considering you landed your plane” on Interstate 4, Davis joked when the applause died down. “It was a good landing,” Ford said, smiling. The actor has historically had a tenuous relationship with the fandom around his character Han Solo, but he appeared genuinely happy to reminisce Thursday about the lasting legacy of Lucas’ creation. Lucas said he had already worked with Ford on “American Graffiti” when he gave Ford the part because it was about “spaceships and flying” and he could fly. 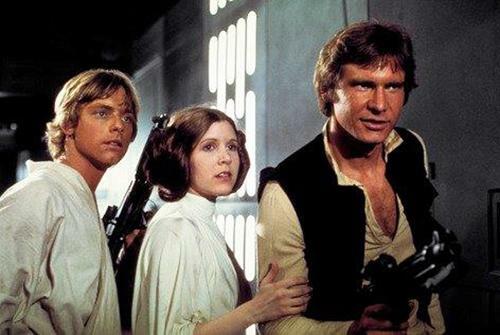 For “Star Wars” super fans, most of the behind the scenes stories told were as well-known as the stories in the actual films – from the fact that Lucas’ inspiration for Chewbacca was his dog Indiana to the actors’ problems with Lucas’ fanciful and technical dialogue. “How can you make it sound like it’s spontaneous dialogue rolling off the tongue?” Hamill asked. “He was right. It was a bit much,” Lucas responded. “I said to George, `You can type this stuff but you can’t say it. Move your mouth when you’re typing,“’ Ford said. Missing, of course, was Carrie Fisher, who died late last year at 60. Lucas and Kennedy saved their words about Fisher for the end. Fisher’s daughter Billie Lourd, who acted alongside her mother in “Star Wars: The Force Awakens,” appeared on stage decked in Princess Leia white to remember her mother and grandmother Debbie Reynolds. Hamill also has planned a Fisher tribute for Friday. Star Wars composer John Williams closed out the session, conducting the Orlando Philharmonic Orchestra in a performance of his score, from the Imperial March to the Main Title. Star Wars Celebration runs through Sunday and includes a myriad of events for fans, many of which can be streamed online. Perhaps the most anticipated is a talk with “Star Wars: The Last Jedi” director Rian Johnson on Friday in advance of its December release. Published: April 13, 2017, 1:04 p.m. Updated: April 13, 2017, 4:32 p.m.